Authentic Geek! 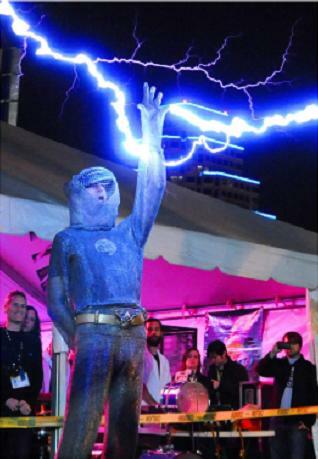 : Doctor Who Theme Performed With Tesla Coils or "Science Makes Music, Not War"
Doctor Who Theme Performed With Tesla Coils or "Science Makes Music, Not War"
ArcAttack, a musical performing group who use hand-made Tesla Coils (!!! ), recently performed their rendition of the classic "Doctor Who" theme at the Bay Area Market Fair. This is SO AWESOME! I can't believe the people in the crowd weren't going Bananas cuz i sure am, so cool i wish i could do that!